Alfred Helmut Naujocks (20 September 1911 – 4 April 1966), alias Hans Müller, Alfred Bonsen, and Rudolf Möbert, was a German SS functionary during the Third Reich. He took part in the staged Gleiwitz incident intended to provide the justification for the attack on Poland by Nazi Germany, starting the Second World War in Europe. Naujocks was born in Kiel and attended the University of Kiel where he studied engineering and, after an incomplete apprenticeship as a precision mechanic, he joined the SS in 1931. A well known amateur boxer, he was frequently in brawls with the communists. He then signed on as driver for the SD-Regional Command East, Berlin in 1934. He led an undercover attack on an anti-Nazi radio station in the village of Slapy in Czechoslovakia on 23 January 1935. 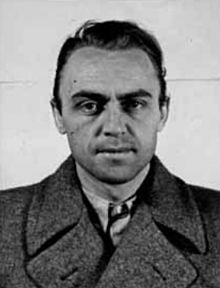 Black Front activist Rudolf Formis was killed in the incident; Naujocks confessed to the murder in 1944 while in American custody. By autumn 1937, Naujocks was promoted to Hauptsturmführer (captain) and by 1938 was promoted again to Sturmbannführer (major). On 10 August 1939, Reinhard Heydrich directed Naujocks of his mission to lead a small group of German operatives to seize the Gleiwitz radio station. Thereafter, on the night of 31 August, Naujocks led the attack on the German radio station Gleiwitz, one of twenty-one similar concentrated attacks that the Germans quickly attributed to the Polish. Once inside the radio station, a short broadcast of an anti-German message in Polish was made (although sources vary on the content of the message). Shots were then fired in the studio and a corpse left on the floor near the microphone. To add documented proof of this attack, the SD operatives placed fictitious Polish troops (corpses of prisoners from the Dachau concentration camp who had been dressed in Polish uniforms provided by the Abwehr, killed by lethal injection, and then shot for appearance) around the 'attacked' radio station for selected members of the press to see at the site of the incident. These attacks, but not exclusively the Gleiwitz incident, formed Hitler's justification to the Reichstag regarding the necessary "pacification" of Poland, thereby setting Second World War in Europe into motion. Later, on 9 November 1939, Naujocks (along with Walter Schellenberg) participated in the Venlo incident, which saw the capture of two British SIS agents, Captain Sigismund Payne Best and Major Richard Henry Stevens in the Netherlands. In early 1940, Naujocks was put in charge of the counterfeiting unit of the SD charged with forging British bank notes under Operation Andreas. By late 1940 Naujocks had been removed from his position after he fell out of favor with Heydrich. In 1941, he was dismissed from the SD after disputing one of Reinhard Heydrich's orders. He was demoted and had to serve in the Waffen-SS on the Eastern Front. In 1943, due to his health, he was sent to the West, where he served as an economic administrator the following year for German troops in Belgium, while involving himself in the deaths of several Belgian Underground and Danish resistance members. After his promotion to Obersturmführer (first lieutenant) he participated in sabotage and terrorist actions against the Danish population from December 1943 until autumn 1944, as the leader of the "Peter Group", including the murder of a Lutheran pastor Kaj Munk. Later leadership passed to SS-Hauptsturmführer Otto Alexander Friedrich Schwerdt (SS-Jagdverbände). Circa November 1944, Naujocks turned himself over to American forces, who subsequently placed him in detention as a possible war criminal by the end of the war. At the Nuremberg Trials, Naujocks declared the attack against German Radio Tower in Gleiwitz was under orders from Heinrich Müller, the head of Gestapo and his superior, Reinhard Heydrich. After the war, he escaped from custody before his trial for war crimes, and lived in hiding into the 1960s. He worked as a businessman in Hamburg, where he eventually sold his story to the media as The Man who Started the War. He was alleged to have been involved in running ODESSA, together with Otto Skorzeny, who handled contracts with the Spanish government, supplying passports and arranging for funds. Naujocks and his associates handled former Nazi war criminals going to Latin America, being responsible for their reception and protection there. Naujocks died of a heart attack in Hamburg on 4 April 1966, aged 54. ^ a b Shirer, William L. (1960). The Rise and Fall of the Third Reich. New York: Simon and Schuster. pp. 518–520. LCCN 60-6729. ^ Weale 2010, p. 137. ^ a b c d e S. Wistrich, Robert (4 July 2013). Who's Who in Nazi Germany (3rd ed.). Routledge. p. 176. ISBN 978-1-136-41388-9. ^ a b Weale 2010, p. 138. ^ Klimek, Antonín (2003). Vítejte v první republice. Praha: Havran. pp. 251–253. ISBN 80-86515-33-8. ^ Weale 2010, p. 139. ^ Ailsby 2001, p. 112. ^ Benz (2007). A Concise History of the Third Reich, p. 170. ^ Murder of Kaj Munk, findagrave.com; accessed 22 January 2015. Ailsby, Christopher (2001). The Third Reich Day by Day. Zenith Imprint. ISBN 0-7603-1167-6. Mallmann Showell, Jak P. (2009). Enigma U-Boats, revised edition, page 166. Weale, Adrian (2010). The SS: A New History. London: Little, Brown. ISBN 978-1408703045. Wikimedia Commons has media related to Alfred Naujocks.